Tany parents credit a solid routine with their happiness and normalcy in a home with small children. Our home is no different. My son thrives off of routine, helping him to know exactly what to expect each day. He is much happier and sleeps much better because of this. Routine also allows us as parents to plan out our days and weekends so we know what we can and can’t commit to, and we can ensure (as much as possible) that we’ll have a happy baby wherever we go. However, it can be really difficult to stick to a routine when leaving the house. Going to grandparents’ houses, staying at a hotel, or anytime we leave our home poses a possible threat to our beloved routine and happy baby. I know many parents can relate. So whether you follow Eat Play Sleep or Play Eat Sleep, figuring out how to easily keep with your routine while away from home is vital, and luckily I’ve found a great product that can help. As someone who follows a routine regularly and needs to keep her baby on a schedule, the FastAsleep playard has been an awesome product for our family. Chicco is a brand that I love and trust. They have been manufacturing baby gear for more than 50 years, including the #1-rated KeyFit 30 Infant and NextFit Convertible Car Seats, the first-of-its-kind Fit2 Infant & Toddler Car Seat, and a full line of playards, highchairs, car seats, strollers and more. When looking for a playard that is good for travel, the FastAsleep was an easy choice. It’s a new kind of playard that has been expertly engineered to simplify travel and everyday life with our babies and toddlers. There are so many things that make it perfect for the growing on-the-go family. 1. Great to travel with. 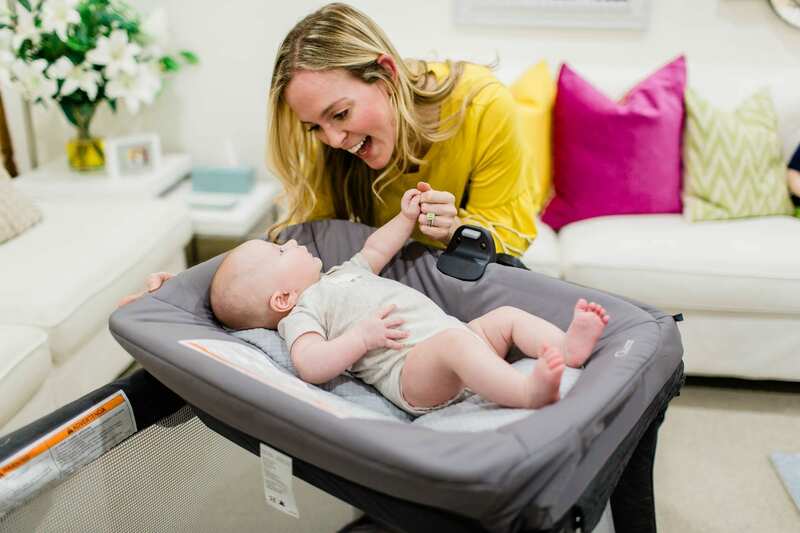 It’s obvious that parents need to bring a pack-and-play when traveling overnight with baby, but a lot of pack-and-plays can be extremely bulky and take up the majority of your trunk. The FastAsleep folds up compactly and has carry bags perfect for bringing to and fro. Chicco also has a GO model, which is a perfect playard for travel for babies and tots who don’t need the 2-in-1 changer/ napper! 2. Easy to open and close. Assembly can be a pain, but the FastAsleep couldn’t be simpler. It’s ready in a snap – no assembly required. Closing is just as simple. Once you remove the mattress, just press the button and pull down each leg to compactly fold the playard. Place it in the travel bag and you’re ready to go! When you have a baby or a toddler, things get messy. We need to be able to quickly and easily clean when accidents happen. The FastAsleep has zip-and-wash fabrics that make cleaning a breeze. 4. Great for all ages and stages. This is one of my favorite points. Yes, it’s compact, easy to travel with, AND this playard really grows with your family. It’s a full-size playard, which is great for playtime or naptime for your tots (up to 30 lbs! ), and it comes complete with a 2-in-1 changer/napper perfect for a newborn. 5. Switch from diaper changes to naptime in seconds. I love that the FastAsleep has a 2-in-1 changer/napper. This makes it easy to switch from diaper changes to naptime in a flash. Push the button on the side and flip over for a comfy spot for your newborn to nap. 6. The perfect home away from home. The FastAsleep playard is optimized for comfort and convenience, offering a full-size sleeping area, padded mattress, zip-and-wash fabrics and carry bag for on-the-go use. The materials are soft, high-quality and a perfect spot for our babies to continue their routines safely while somewhere new. We’ve had the best personal experience with the FastAsleep Playard. My own family is quickly growing: Liam has a cousin who’s a year older than him, and another little two month old to love on! Our family gatherings are messy and beautiful and full of dirty diapers, play time, and naps. The FastAsleep has provided a place for our littlest family member to safely sleep and for our tots to play and explore. The FastAsleep is available online and in stores for $179.99. And a GO model of the FastAsleep, which does not include the 2-in-1 changer/napper, is available for $149.99. Buy your’s HERE!